Defense Minister Liberman promises southern residents: 'If Hamas continues pushing us into another operation, we'll have another operation. Defense Minister Avigdor Liberman (Yisrael Beytenu) on Friday morning met residents of the Gaza area town of Sderot. "Every sane person who sees natural groves burned and thousands of dunams of agricultural fields scorched, understands that this is not reasonable," Liberman said. "Accepting such a reality, when at the end of the week residents of towns near the Gaza border had to run to bomb shelters 20 times or prepare their safe room as part of their preparations for Shabbat (the Sabbath) - this is insufferable." 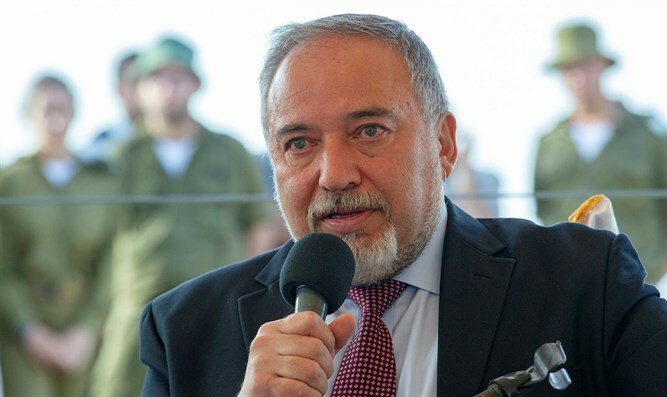 According to Liberman, Hamas leaders are pushing Israel to conduct a large-scale military operation, a situation "in which we will need to begin a widescale and debilitating military operation, not just an operation that seems to be widescale and debilitating. I think that all the responsibility in such a case rests on the heads of Hamas, but unfortunately the lay residents of Gaza will have to pay the price." Liberman also encouraged Gazans to "put pressure on Hamas to change direction and the equation." "You can go back to a normal civilian reality, to better economics, in exchange for a complete cessation of terror and the provocations on the border," he emphasized. "This is an untenable reality, and truly, we are acting reasonably and responsibly. But it's not a burned natural field and grove, it's a different equation, it's about the erosion of deterrence. The most important thing is that citizens feel secure. This is a situation which we cannot accept. "Every day that passes and Hamas continues - and there should be no illusions or misunderstandings, this isn't spontaneous, it's not children, and it's not the public, it's Hamas leaders who are leading all these fires, all the [incendiary] kites, and all of the border clashes." When asked whether he believes the Israeli government erred by not responding to the recent wave of kite terror, Liberman said, "I think that we acted in the most appropriate way from the very beginning. Now as well, we are acting appropriately." "I want to remind you that at the 'march of the million,' as they called it, during the border provocations, 159 terrorists were killed, and 5,000 were injured. We hit Hamas' critical infrastructure, including for production, an ammunition storehouse, a central training base. We destroyed two tunnels, each of which took between 3-4 years [to build]. "By the way, Hamas is insensitive to human life. On the contrary - from their perspective, every person killed is a shahid (martyr) and a weapon to use against Israel. They aren't sensitive to the loss of human life. They are sensitive to their production sites and to their tunnels, which are what we deal with first. Over the last weekend, we dumped almost fifty tons of ammunition into those same strategic centers [belonging to] Hamas, and I think our message was understood. And if it wasn't understood, we'll need to continue. "I think it's obvious to everyone that no one is looking for adventures, we're acting responsibly. At the same time, we are acting with strength and with wisdom, and if they continue pushing us to a widescale operation, then we will have a large-scale operation, on a wider scale and more debilitating than [2014's] Operation Protective Edge." Emphasized that Israel is not in contact with Hamas, Liberman concluded, "We are in close contact with all relevant parties, whether they are Egypt or a United Nations emissary."